Responsive real estate website design is more than just a valuable tool for real estate agencies; it might actually be your real estate agency’s best friend! Now that the majority of real estate clients use a mobile device at some point during their home search (a whopping 89%, according to a recent report from Google! ), real estate agents are turning to responsive design to make certain their customers have a positive online experience, no matter how they access the web. If your website is not designed to perform flawlessly on every type of mobile device, prospective real estate clients will have no problem finding a more mobile-friendly site to turn to! One of the best times to connect with real estate customers is when they are actively engaged in their home search. If you can keep customers engaged and interacting with your website throughout their search process, you will be able to generate more real estate leads online. Our responsive real estate web designs incorporate features that will enable your customers to perform all the on-the go tasks involved in house hunting in one convenient place. Home buyers can search for listings, find directions to the houses they want to view, research additional information on listings, access open house listings, call to set up an appointment for a viewing, and more, without ever leaving your site. Your real estate customers are accustomed to browsing online to find properties wherever and whenever they have a free minute to spare. When home buyers are searching properties on the go, they don’t have the patience to fumble with sites that are difficult to navigate. When your real estate website is created using responsive design, all of the design and navigation elements automatically resize so their dimensions are the best fit for the user’s device. This is a critical feature that eliminates many of the difficulties that can occur with mobile devices, such as buttons that are too small or too tightly spaced to work with thumbs. Fonts automatically resize as well, so your real estate customers can easily read listing information without the need to zoom in. When home buyers search online for properties, they want to be able to view accurate representations of the houses, surrounding grounds, and any amenities. With a standard website that’s not optimized for mobile, pictures can become stretched or pinched, presenting a distorted view that makes it hard to distinguish details. The large, showy photos that real estate agents use for their premium featured listings are often sized so large that they do not fit in most mobile devices’ viewports, so searchers are forced to scroll left and right to try to see the entire image. For Sale Marketing’s real estate websites are created using responsive design so pictures are automatically resized to the optimum dimensions for the device on which they are viewed. Whether home buyers access your site using a smartphone, tablet, or other mobile device, they will be able to view all your listing photos in perfect clarity and detail. Real estate clients perform different actions depending on the device they are using to view your website; with our responsive design, your pages automatically respond to reflect this and provide a seamless experience. Your site automatically adjusts to portrait or landscape viewing, with content that flows to fill the viewport so visitors can see all the details of your listings by scrolling down, with no need to scroll from side to side. Tablet users can easily browse through galleries of photos and watch full-screen videos of your properties and neighborhoods. Your property detail pages can also feature photos of listings with addresses and links to mapping features that encourage smartphone users to visit properties in person. We can even include click-to-call functions to make it easy for home searchers to schedule a viewing with you without ever leaving your website. Since web forms are one of the primary ways to generate real estate leads online, you need them to provide easy usability no matter what device visitors are using. Using responsive design, For Sale Marketing can ensure your forms function perfectly when accessed by a variety of devices. All of the key elements on your forms are altered to work flawlessly on every device, which encourages visitors to complete the fill-in process. Drop-down menus and radio buttons are easily clickable, and form fields instantly resize to fit portrait and landscape modes. To help ensure you get usable data from every visitor, smartphone users are provided with shorter forms, and submit and clear buttons are easy to see and access on every device. 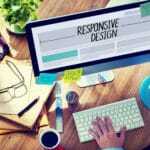 As an added benefit, Google loves websites created using responsive design. Citing such features as reduced load times and the ability to minimize the common mistakes that affect mobile sites, Google actually recommends responsive design as their preferred website format. Google now ranks responsive real estate websites higher in search results than websites that lack these mobile-friendly features, giving your website an instant boost in search engine results. Since Google is in charge of indexing your site and ranking it in search results, using their preferred format is a smart design decision.